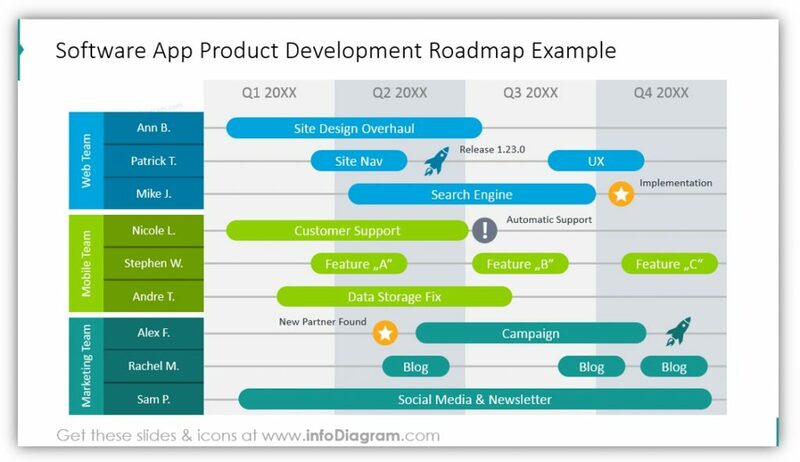 Roadmap graphics are a representation of the timeline for product development or company strategies. These strategies might be planned for months or years in the future. They are marked with project milestones or company objectives. You can also highlight the duration of tasks or the deadlines for achieving certain deadlines. 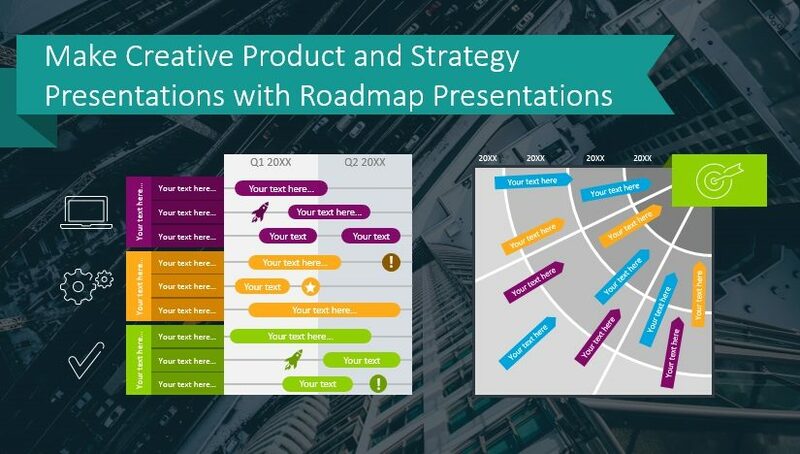 Whether you’re presenting a long-term company strategy to new recruits or investors, showing the history of your business activities, or planning product/software development and launches, you can utilize roadmap graphics. Imagery will help your audience follow along, maintain their attention, and make sure they understand your message. 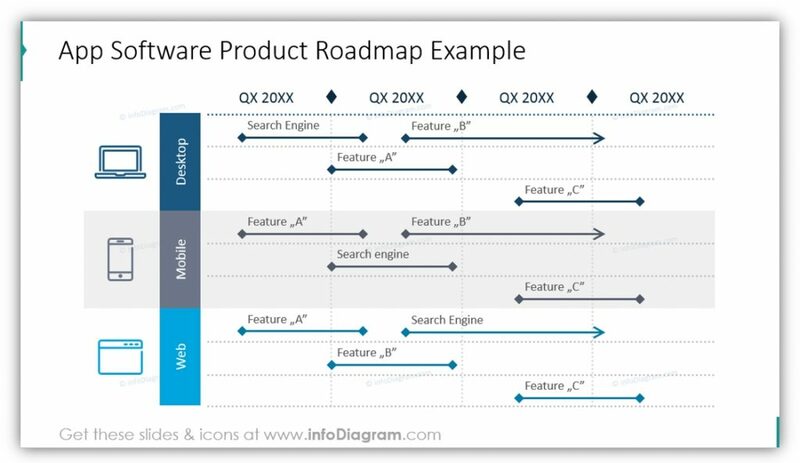 All example slides below are accessible in Product and Strategy Roadmap Presentation PPT Tables. 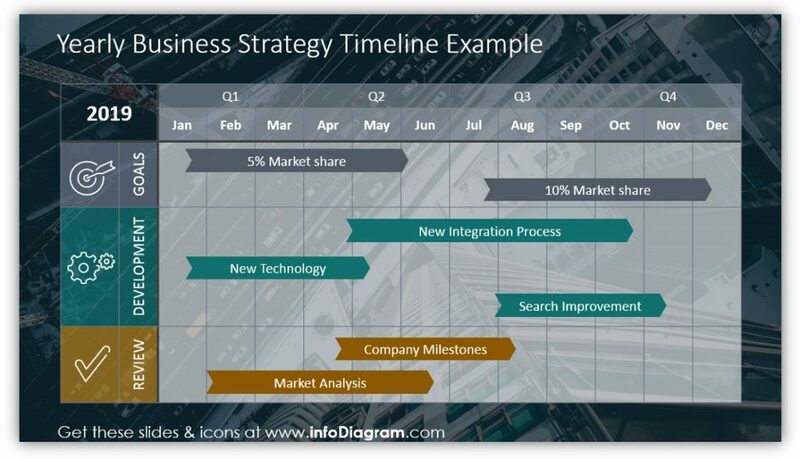 You can showcase your business strategy using a roadmap table. In this example, you see how much time, and at what point in the year, your teams will be focusing on review, development, and achieving goals. You also are able to highlight the things which need to be your focus within these phases and time periods. In this example, you can showcase the different elements of numerous releases or stages of the same release. Showcase the different marketing, fix, and new feature processes which are essential to each release. You can add as many or as few details as you would like for each stage, area of focus, or release. Want to explain the responsibilities assigned to teams, or even to team members within your organization? 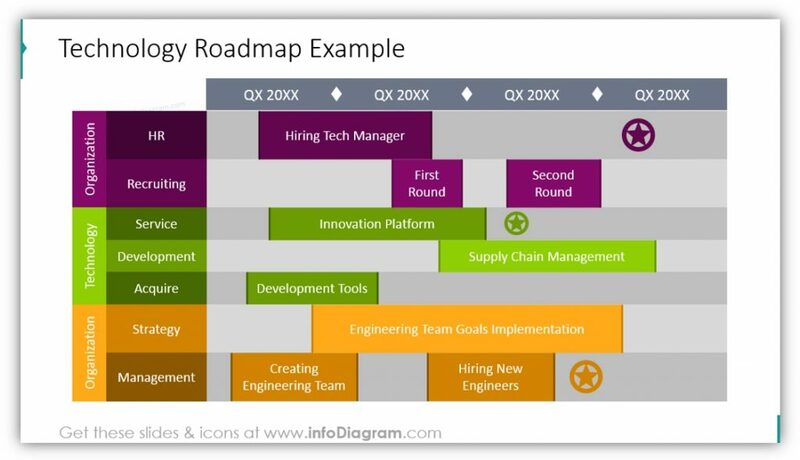 Use roadmap tables. You can explain the responsibilities, timelines, teams involved, and more with one graphic. 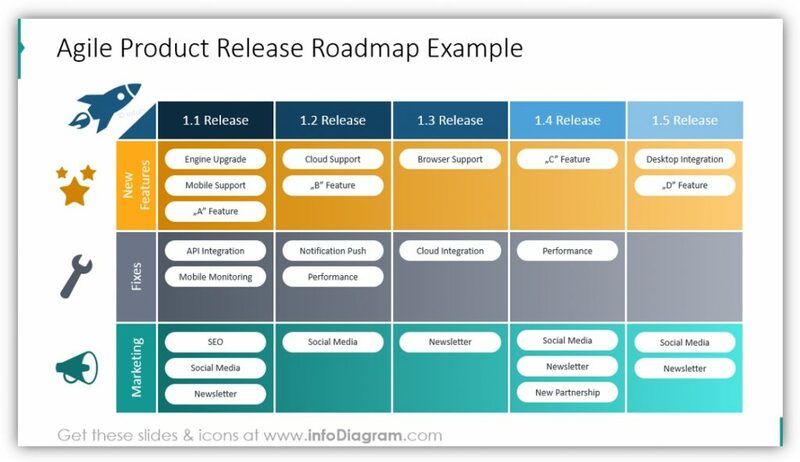 If you’ll be launching the same or similar releases across multiple platforms, roadmap icons can help you showcase the different stages. This will be helpful to those whose responsibilities overlap across different platforms or phases of a release. You can track the timeline of a project from every phase of development, including when HR and recruiting departments seek out qualified candidates to make the project happen. Including Organization departments and Management teams in your road maps will help make the presentation more cohesive and show how everyone is on the same team when it comes to achieving the final goal. You can explain your business strategy, a project release or development timeframe. You can also highlight different platform releases and track projects across departments. All businesses have timelines and expectations. Whether you need to explain achievement timelines and provide deadlines for achieving goals or are actually sharing when stages of development need to be completed, roadmap tables will be a significant asset. When you share your expectations in this concrete way, it’s easier to hold individuals and teams accountable. By customizing these tables to suit your needs, you’ll always have attention-grabbing imagery for your presentations.